Objective The objective was to analyse and compare puff and exhalation duration for individuals using electronic nicotine delivery systems (ENDS) and conventional cigarettes in YouTube videos. Methods Video data from YouTube videos were analysed to quantify puff duration and exhalation duration during use of conventional tobacco-containing cigarettes and ENDS. For ENDS, comparisons were also made between ‘advertisers’ and ‘non-advertisers’, genders, brands of ENDS, and models of ENDS within one brand. Results Puff duration (mean =2.4 s) for conventional smokers in YouTube videos (N=9) agreed well with prior publications. Puff duration was significantly longer for ENDS users (mean =4.3 s) (N = 64) than for conventional cigarette users, and puff duration varied significantly among ENDS brands. 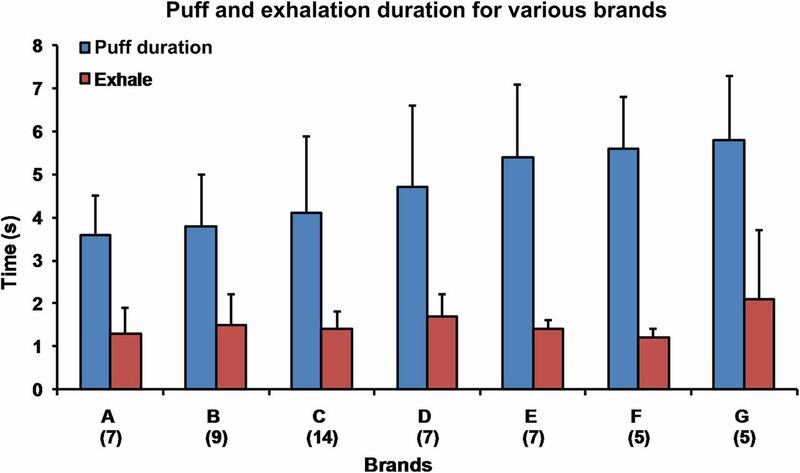 For ENDS users, puff duration and exhalation duration were not significantly affected by ‘advertiser’ status, gender or variation in models within a brand. Men outnumbered women by about 5:1, and most users were between 19 and 35 years of age. Conclusions YouTube videos provide a valuable resource for studying ENDS usage. Longer puff duration may help ENDS users compensate for the apparently poor delivery of nicotine from ENDS. As with conventional cigarette smoking, ENDS users showed a large variation in puff duration (range =1.9–8.3 s). ENDS puff duration should be considered when designing laboratory and clinical trials and in developing a standard protocol for evaluating ENDS performance. Electronic nicotine delivery systems (ENDS), also called electronic cigarettes or e-cigarettes, were invented in China and have recently been distributed worldwide.1–3 In the USA, ENDS are readily available to anyone, including children under 18, in shopping malls and on the internet. ENDS are designed to deliver nicotine to users without burning tobacco. Nicotine is an addictive and dangerous chemical that can cause death of adults at doses of 60 mg,4 promote tumour growth5 ,6 and potentially be converted to carcinogens.7 ENDS vapourise a liquid-containing nicotine, a humectant, such as propylene glycol, and flavourings upon heating by a battery-powered atomiser to create a puff of aerosol inhaled by the user. Little is known about the effects of ENDS on human health, performance properties, their potential hazards or the quality control with which ENDS products are manufactured. Reasons for concern include the presence of diethylene glycol (a toxicant) in ENDS fluid, inaccurate labelling of nicotine concentrations, poorly written user manuals and leakage of cartridge fluid.8 ,9 In addition, aerosol density varied significantly from puff to puff when ENDS performance was analysed using a smoking machine,10 suggesting that nicotine delivery is not uniform among puffs. In agreement with the smoking machine data, other recent studies found low levels of nicotine in the blood of individuals using ENDS.11–13 In spite of the questionable efficiency of ENDS to deliver nicotine, there are numerous testimonials on the internet suggesting that users are able to derive sufficient nicotine from ENDS to make them desirable products. The purpose of this study was to ascertain if ENDS are used differently than conventional cigarettes and to specifically test the hypothesis that ENDS users take longer puffs than conventional cigarette users. Longer puff duration may be a compensatory mechanism that enables ENDS users to obtain sufficient doses of nicotine to make ENDS usage attractive. We have tested the above hypothesis by analysing individuals using ENDS in YouTube videos. Videos showing individuals using ENDS were found on YouTube with ‘e-cigarettes’, ‘e-cigarette reviews’, ‘electronic cigarettes’ and ‘e-cigarettes comparison’ as search terms, while smokers of conventional brands were searched using ‘cigarettes’, ‘cigarette reviews’ and ‘Marlboro cigarette reviews’. Videos that clearly showed men or women smoking conventional cigarettes (N=9) or ENDS (N=64) were randomly selected from pages retrieved in the YouTube searches or using links from videos retrieved with the search terms. Nine conventional videos were deemed sufficient as preliminary analysis of puff duration gave results similar to published values.14 The ENDS sample size was larger as this group was being analysed for the first time. The final data set contained 64 different ENDS users. Only videos showing ENDS users (not electronic cigar users) were included in our analysis. Data on individuals used in this study are given in table 1. Twenty-five different user-identified ENDS brands, two unknown ENDS brands, three user-identified conventional brands and five unknown conventional brands were represented in the study. Specific parameters that were monitored for both conventional cigarettes and ENDS included puff duration and exhalation duration (seconds), brand and/or model of each product used (if known), gender of users and age of users (if known). Puff duration and exhalation duration were measured using a stopwatch while observing individuals smoking in the videos. For conventional cigarettes, a puff was defined as the interval between the time a user placed a cigarette in their mouth and the first smoke was exhaled from their mouth. For ENDS users, a puff was defined as the interval between the time the LED light came on until the first aerosol was exhaled from their mouth. In a few instances, the user was clearly drawing on the ENDS briefly before the LED lighted. In these cases, the drawing interval was included in the overall puff interval. Exhalation began when the user started expelling smoke/aerosol from their mouth and stopped when all smoke/aerosol had been released. In the 64 videos containing different individuals, the number of puffs per video varied from 2–10. Average puff duration and exhalation duration were measured for each of the 64 videos. When a particular user appeared in more than one video, the video with the largest number of puffs was used to compute averages for puff duration and exhalation duration for that individual. If one individual appeared in two videos and both had the same number of puffs, the average from the first video in the data set was arbitrarily chosen. Puff and exhalation duration were scored in each video by two observers. Inter-observer reliability was determined by dividing the total number of seconds agreed upon by the total number of seconds. For ENDS, inter-observer reliability was 96.7% for puff duration and 91.3% for exhalation duration. For conventional cigarettes, inter-observer reliability was 93.3% for puff duration and 92.8% for exhalation duration. Conventional cigarette puff duration data for both observers were averaged to produce a mean for each video, and a grand mean was then computed for this group. Similar processing was then performed for the conventional smokers exhalation duration group and for the ENDS users puff and exhalation duration groups. In some analyses, ENDS users were classified as ‘advertisers’ if they clearly disclosed in the video that they sold ENDS or received remuneration from an ENDS company or if they provided a coupon link to a company web site. Users that did not meet ‘advertiser’ criteria were classified as ‘non-advertisers’. t Tests were used when comparing means from two groups (eg, puff or exhalation duration for conventional cigarette vs puff or exhalation duration for ENDS, advertisers vs non-advertisers, men vs women or models within a brand). For all t tests, data were first checked to establish if the assumptions of t testing were satisfied (ie, SDs were equal and data were sampled from a Gaussian distribution). In some comparisons, SDs were not equal in which case data were transformed to log10 before running the analyses. When more than two groups of means were compared (puff duration and exhalation duration for various brands of ENDS), data were analysed for statistical significance using a one-way analysis of variance (ANOVA) followed by a Tukey comparison of all groups. Before running the analysis, data were checked to determine if they met the assumptions of ANOVA (homogeneity of variances and data were sampled from a Gaussian distribution). All analyses were done using InStat or GraphPad Prism software (GraphPad, San Diego, California, USA). Means were considered significantly different when p≤0.05. Seventy-three different YouTube videos that included 64 different ENDS users and nine different conventional smokers were analysed (table 1). Men outnumbered women by about 5:1. Among ENDS users, 53% could be identified as ‘advertisers’, while 47% were ‘non-advertisers’. Within the group of advertisers, 85% were men and 15% were women. This gender distribution was significantly different (p<0.0001) by χ2 analysis. For the 53 individuals where age was self-reported on YouTube, the majority were between 19 and 35 years old, and none were older than 46. For videos lasting 8.5–10.5 min (N=15), the average number of puffs was 6 (SD=2.4). Puff duration for YouTube smokers of conventional cigarettes (N=9) averaged 2.4 s (SD=±0.8) (figure 1), which is in good agreement with previously reported data.14 In contrast, the average puff duration for all ENDS users in the study (N=64) was 4.3 s (SD=1.5), which was significantly longer than puff duration for the conventional smokers (p<0.0001) (figure 1). The average duration for exhalation was 1.6 s (SD=0.3) for conventional smokers and 1.7 s (SD=0.9) for ENDS users, and these values did not differ significantly (p=0.85). Comparison of puff duration (seconds) and exhalation duration for users of conventional cigarettes and electronic nicotine delivery systems (ENDS). The number of individuals per group is given in parentheses on the x-axis. ENDS users had significantly longer puff duration than conventional smokers (p<0.0001). However, puff duration for ‘advertisers’ and ‘non-advertisers’ did not differ significantly from each other (p=0.94). 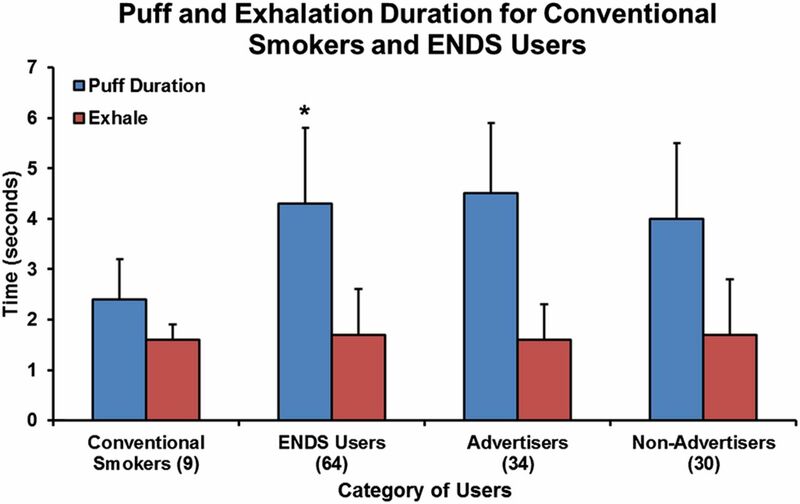 There was no significant difference in exhalation duration between conventional smokers and ENDS users or between the ‘advertiser’ and ‘non-advertiser groups’. Data are plotted as the means±SD. *p<0.0001 for ENDS groups compared with the conventional smoker group. Product brand names are available from the authors. Average puff duration for ENDS ‘advertisers’ and ‘non-advertisers’ were 4.5 s (SD=1.4) and 4.0 s (SD=1.5), respectively. These means did not differ significantly from each other (p=0.18) and were similar to the mean for the total population of ENDS users (4.3 s). For ‘advertisers’, the average exhale duration was 1.6 s (SD=0.7), while for non-advertisers, the average exhale lasted 1.7 s (SD=1.1). The averages were not significantly different (p=0.94). For men, puff duration averaged 4.3 s (SD=1.6), while for women, this average was 4.0 s (SD=0.8), which was not significantly different from the average for men (p=0.85). Likewise, exhalation duration, which for men was 1.7 s (SD=0.9) and for women was 1.7 s (SD=±0.6), did not differ significantly between genders (p=0.51). These data indicate that gender does not affect puff duration and exhalation duration for ENDS users. The data set contained seven ENDS brands for which there were at least five different users who smoked two or more puffs (figure 2). Mean puff duration varied across brands from a low of 3.6 s (SD=0.9) to a high of 5.8 s (SD=1.4). ANOVA revealed a significant difference for puff duration means among brands (p=0.0075). Exhalation duration ranged from 1.3 s (SD=0.6) to 2.1 s (SD=1.4). Means for exhalation duration were not significantly different (p=0.39). Comparison of the puff duration (seconds) and exhalation duration for various self-identified ‘brands’ of electronic nicotine delivery systems (ENDS). A–G denote different brands of ENDS, and the number of individuals per group is given in parentheses on the x-axis. Puff durations were significantly different for these brands of ENDS (p<0.0075). Product brand names are available from the authors. Two models within one brand were compared. Means for the two models were 3.9 s (SD=1.5) and 4.2 s (SD=2.2), which were not significantly different (p=0.38). Exhalation duration for the two models were 1.4 s (SD=0.3) and 1.6 s (SD=0.5), which did not differ significantly (p=0.38). Conventional cigarette smokers served as a control to validate the usefulness of extracting puff duration data from YouTube videos. Although only nine videos were examined and this could be viewed as a limitation, puff duration for the conventional smokers averaged 2.4 s (SD=0.8), which is in very good agreement with a previously published mean of 2.3 s (SD=0.8) for human subjects in which puff duration was measured in a population similar in size to ours.14 Moreover, the 2.4 s puff duration average that we observed in YouTube videos is in good agreement with the 2 s puff interval that is used in machine smoking protocols standardised by the Federal Trade Commission, state of Massachusetts, Canada and International Organisation for Standardisation (ISO).15 Therefore, the data extracted from YouTube videos reliably estimated the average puff duration for conventional cigarette smokers. Data supported the hypothesis that ENDS users have longer puff durations than conventional cigarette smokers. There are several possible reasons for this. Some human studies found very low levels of nicotine in the blood of ENDS users,11–13 suggesting poor nicotine delivery by ENDS. ENDS users may compensate for poor nicotine delivery by increasing puff duration, thereby increasing the dose of nicotine with each puff. This idea is supported by our observations that generally individuals taking longer puffs exhaled larger amounts of aerosol and that one brand of ENDS requires a 4 s puff to produce aerosol on a smoking machine (not shown). Exhalation duration for conventional and ENDS products were not different, again suggesting that increased puff duration for ENDS products represents a compensatory adaptation to increase the nicotine dose. ENDS performance characteristics, such as the flow rate required to activate aerosol production and pressure drop across ENDS, vary among brands,10 which could contribute to the variation observed in puff duration with brand. In addition, longer puff duration may be an adaption to low-nicotine delivery resulting in brands with the lowest delivery having the highest puff duration. This is a topic that should be investigated in future work. In randomly selected YouTube videos, male ENDS users outnumbered females by about 5:1. It is not known if the higher number of males using ENDS in YouTube videos indicates that more men have adopted ENDS products or if men are more likely than women to post videos of themselves using ENDS on YouTube. Puff and exhalation duration did not differ significantly between men and women, which could indicate that both genders have learned to increase puff duration to increase their nicotine dose. Most ENDS users on YouTube were between 19–35 years old, suggesting that ENDS products appeal mainly to younger segments of the population or that older users do not post on YouTube. A limitation of our study is that only data on puff and exhalation duration were feasible to collect from YouTube videos. In future studies, it would be useful to collect data on ENDS puff duration using other technologies (eg, mouthpiece methods), which provide types of data not possible to evaluate in videos, such as puff volume.16 Our data on conventional smokers support the conclusion that reliable unbiased data can be collected on puff duration from YouTube videos. However, since relatively little is currently known about ENDS topography, further studies using alternative methods will be needed to establish that bias does not exist in ENDS data extracted from videos made for posting on YouTube. In future studies, it would also be informative to determine if ENDS users who have longer puff durations also have higher nicotine levels in their blood. In summary, our study shows that YouTube is a valuable resource for collecting quantitative data on certain aspects of puff topography. Our data when combined with other studies that address health impacts of ENDS could be useful to regulatory agencies as they set policies for ENDS products. Our current study should also be helpful to other researchers working with ENDS and those planning future research with human subjects. Our observation that puff duration for ENDS users is longer than for conventional smokers should be taken into account when setting up future laboratory or human experiments on ENDS and in establishing a standardised protocol for evaluating ENDS performance. The ENDS database that we have created from YouTube videos can be augmented, refined and further analysed as more brands and models of ENDS are introduced and as ENDS continue to evolve in the future. YouTube videos are a valuable resource for acquiring data on ENDS usage. Puff duration for conventional smokers as determined from YouTube videos was in good agreement with prior studies. Puff duration for ENDS users was approximately twice as long as puff duration for conventional smokers. ENDS puff duration should be considered when designing laboratory and clinical trials and in developing a standard protocol for evaluating ENDS performance. We are grateful to the Tobacco-Related Research Program of California and to the UCR Academic Senate for providing funding for this project. We also thank Rachel Behar for assistance preparing the figures and all the Talbot lab staff for their helpful comments on the manuscript.
. Electronic cigarettes: miracle or menace? BMJ 2010;340:c311.
. Pharmacology of nicotine: addiction, smoking-induced disease, and therapeutics. Annu Rev Pharmacol Toxicol 2009;49:57–71.
. Nicotine promotes tumor growth and metastasis in mouse models of lung cancer. PLoS One 2009;4:e7524.
. Nicotine stimulates angiogenesis and promotes tumor growth and atherosclerosis. Nat Med 2001;7:833–9.
. Atmospheric Chemistry Special Feature: Formation of carcinogens indoors by surface-mediated reactions of nicotine with nitrous acid, leading to potential thirdhand smoke hazards. Proc Natl Acad Sci U S A 2010;107:6576–81.
. Electronic nicotine delivery systems: is there a need for regulation? Tob Control 2011;20:47–52.
. Evaluation of e-Cigarettes. St Louis: Food and Drug Administration, 2009:1–8.
. Effect of an electronic nicotine delivery device (e cigarette) on desire to smoke and withdrawal, user preferences and nicotine delivery: randomised cross-over trial. Tob Control 2010;19:98–103.
. Electronic nicotine delivery devices: ineffective nicotine delivery and craving suppression after acute administration. Tob Control 2010;19:87–8.
. Puffing and inhalation behavior in cigarette smoking: implications for particle diameter and dose. J Phys Conf Ser 2009;151:1–6.
. Reconciling human smoking behavior and machine smoking patterns: implications for understanding smoking behavior and the impact on laboratory studies. Cancer Epidemiol Biomarkers Prev 2009;18:3305–20.
. Comparison of methods for measurement of smoking behavior: mouthpiece-based computerized devices versus direct observation. Nicotine Tob Res 2009;11:896–903. Funding This work was supported by Tobacco-Related Research Program of California (grant numbers 18XT-0167 and 20XT-0118) and the UCR Academic Senate. Ethics approval This project was exempted from ethics committee approval on our campus as it involved use of YouTube videos that are part of the public domain. Data sharing statement All data will be provided by request to the senior author.